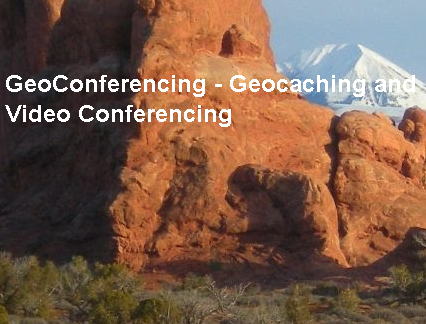 I am sure many of you have heard of Geocaching, and even more of you know about Video Conferencing. A couple colleagues of mine are working to bring the 2 together into one project…GeoConferencing! For those of you not familiar, geocaching is an up and coming outdoor activity enjoyed by many. Geocachers use coordinates and GPS devices to locate items, called caches, that are hidden somewhere in an area that can be accessed by the public. Anyone can hide them and anyone can find them. It is a great way to enjoy the outdoors with a purpose! For more information on geocaching, check out the geocaching website. It has a video introduction that explains the process a lot better than I can. If you think this is not a popular activity, go to the site and search your zip code to see how many caches are hidden in your area. My zip code brings up 9,888 caches! @agpeterson75 and @jefflcisd have started a project that involves a couple of classes in Texas that reside on opposite ends of the state. Each class purchased 2 travel bugs and hid them in a cache in their area. The travel bugs are registered on the geocaching.com website. When someone finds the bug in a cache they can take it with them and place it in another cache along the way. They then log into the geocaching.com website and record when/where they picked the travel bug up and dropped it off. As the bug moves along, the classes are plotting their progress. When the bug moves to a new location, they do a little research on the area it is in. Through video conferencing both sides share where their travel bugs are at the moment and what they have discovered about that area. The goal is for the travel bug to travel across the state to their partner school, but the fun is in what happens along the way! This example focuses mainly on Social Studies with an emphasis on Geography, but please don’t assume this type of activity is limited to only Social Studies projects. By using your imagination you can make connections across the curriculum. To learn more about GeoConferencing, visit the geoconferencing.com website. It will tell you what materials you need to get started, talk a bit about the experiences they have had with this project, and give ideas as to how this can be integrated in other subject areas. There are detailed instructions to guide you through the entire process. Great job Jeff and Amanda! ← Say it with Clay(mation)!